Air traffic control (ATC) is a service provided by ground-based controllers who direct aircraft on the ground and in the air. The main job of ATC is to separate aircraft to prevent crashes and to make sure aircraft are running on time and as fast as possible. In some countries, ATC may also play a security or defense role (as in the United States), or actually be run entirely by the military (as in Brazil). Air traffic control was first introduced at London's Croydon Airport in 1921. Archie League, who controlled aircraft using colored flags at what is today Lambert-St. Louis International Airport, is often considered the first air traffic controller. Preventing crashes is done by what is called separation. This means that the aircraft are kept apart by a minimum distance at all times. Modern aircraft also have collision avoidance systems that see nearby aircraft and warn pilots if other planes are too close. This system is a backup for when air traffic control is not available or if something goes wrong with ATC. Air traffic controllers also can provide information to pilots. But pilots do not have to follow commands of ATC. They can make changes in order to keep plane safe. Air traffic control service is not provided in uncontrolled airspace. Uncontrolled airspace is usually between ground and 1000 feet except areas near airports. These areas are part of controlled airspace. "Ground Control" is responsible for all aircraft and vehicles on all taxiways, inactive runways, holding areas and aprons. "Clearance Delivery" is the position that issues route clearances to aircraft. This is important for safe flying via planned route. Clearance Delivery has to cooperate with the Ground Control and the Area Control centre. "Tower Control" gives clearance to arriving and departing aircraft. All aircraft on runways and airfield traffic circuit are directed by Tower Control too. "Approach Control" is responsible for airplanes in airspace near airport. There is big density of airplanes. That is reason why approach is the most difficult job in compare to another ATC service. "Area Control Centre" separates airplanes in controlled airspace between airports. Airport Traffic Control Tower (ATCT) at Suvarnabhumi Airport, Thailand. Airport traffic control tower 1 (ATCT-1) at Kuala Lumpur International Airport, Malaysia. Traffic control tower at Oslo-Gardermoen Airport, Norway. LaGuardia Airport (LGA) control tower in New York City. Chhatrapati Shivaji International Airport control tower in Mumbai, India. Intersecting contrails of aircraft over London, an area of high air traffic. Airplane taking off from Dallas/Fort Worth International Airport with the ATC tower behind. 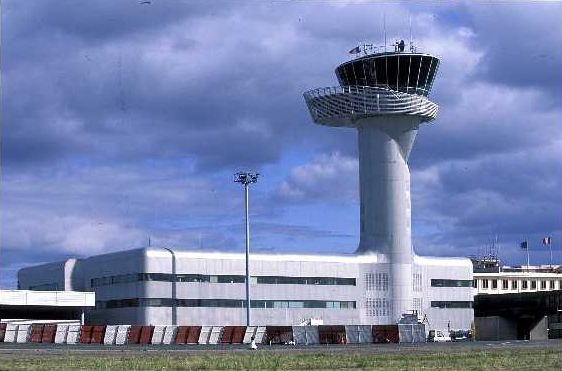 Airport traffic control tower at Bordeaux–Mérignac Airport. 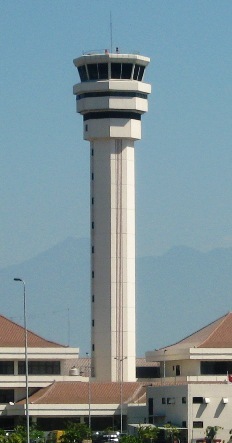 Airport traffic control tower at Juanda International Airport, Indonesia. 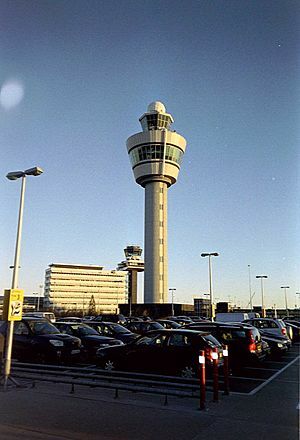 The air traffic control tower at Hartsfield–Jackson Atlanta International Airport. Air traffic control Facts for Kids. Kiddle Encyclopedia.